March 28, 2018 By Allyson 9 Comments This post may contain affiliate links. Read my disclosure policy. 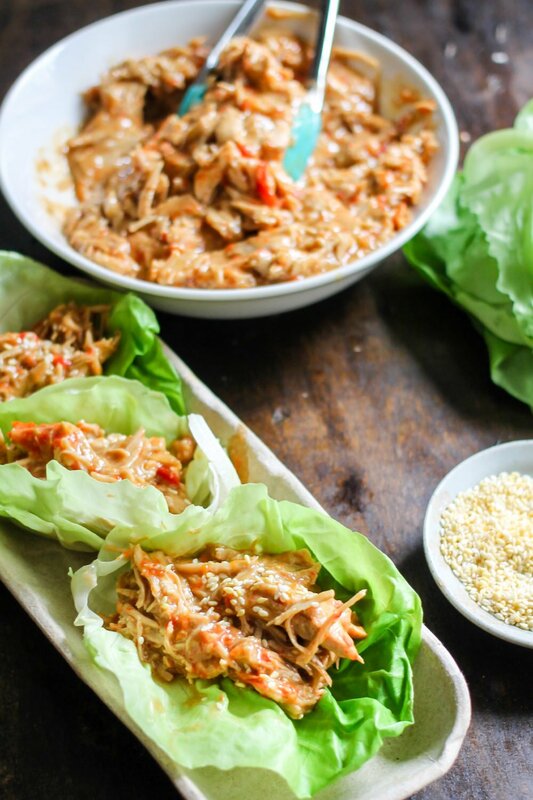 Thai Lettuce Wraps can be made with pork or chicken in the instant pot or slow cooker! Juicy pork or chicken covered in an easy Thai peanut sauce makes the perfect healthy easy dinner! I love simple meals like these Instant Pot Thai Lettuce Wraps because they are easy, delicious, and take practically no time to cook! The Thai Peanut Sauce on the pork lettuce wrap is unbelievably juicy and flavorful. You can use pork or chicken in this healthy easy recipe, they are both equally delicious. With only a handful of ingredients in Thai Lettuce Cups, you probably have everything in your pantry and will just need to grab the meat and red peppers. I love using my Instant Pot because it reducing cooking time drastically without losing any of the flavor! I recommend the 6qt Instant Pot for this recipe, however the 8qt instant pot would be great as well! Mix together the Thai sauce. Add the pork, red peppers, and sauce to the Instant Pot. Cook on manual pressure for 30 minutes, then naturally release the pressure for 10 minutes. Release the rest of the pressure manually (flip the switch), then carefully open the top. Remove the pork and shred it using 2 forks or a stand mixer. Add a cornstarch slurry and peanut butter to the instant pot, set the temperture on saute to bring it to a boil. Once boiling, turn the heat off and add the shredded pork back to the pot. Serve Thai pork in lettuce wraps topped with sesame seeds. The instructions stay the same as the pork version, however if using the instant pot, you will reduce the cooking time. Place 2lbs chicken breasts into the instant pot with the red peppers and sauce. Set manual for 10 minutes. After the 10 minutes cook time is up, let the pressure release naturally for 10 minutes. Release the rest of the pressure manually (flip the switch). Follow the remaining instructions by shredding the chicken etc. Head over to this recipe for specific directions for the slow cooker! Is Thai Chicken or Thai Pork Spicy? The spice level of Thai chicken or Thai pork will depend on how much red pepper flakes you add to the recipe. If you want the spice level mild, don’t add as much as listed. For average spice, follow the directions. For more spiciness, add more red pepper or a bit of sriracha to top the lettuce wraps. Cook up some easy brown or white rice in the instant pot, and serve alongside the lettuce wraps. Quinoa fried rice would be delicious with this healthy dinner! Spicy Green Beans would make a delicious side dish to the Thai Pork Lettuce Wraps. 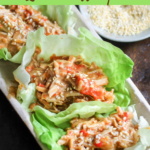 Instant Pot Buffalo Chicken Lettuce wraps are the perfect healthy chicken recipe! Make the spicy chicken in just minutes, then load up fresh lettuce wraps with your favorite toppings! Instant Pot Asian Pork cooks up in just minutes, and is the perfect healthy dinner! Use the juicy meat in lettuce wraps, sliders, or a salad! Instant Pot Bang Bang Chicken comes together in minutes and is so delicious! 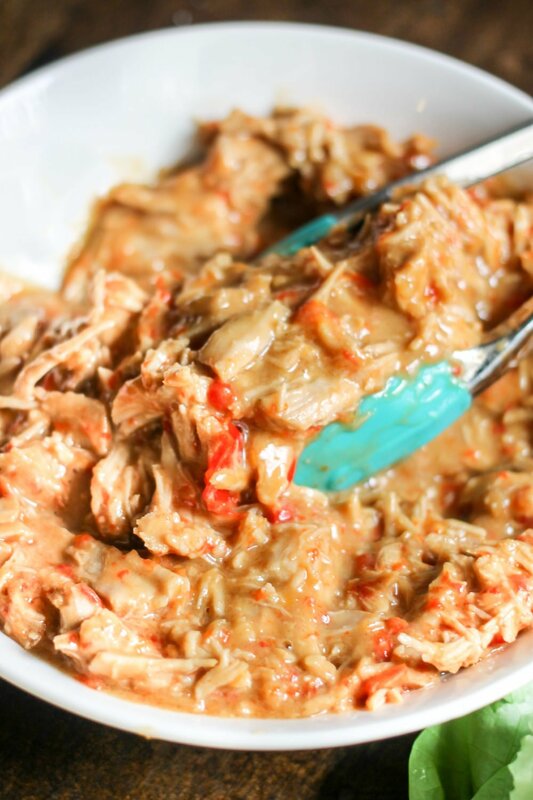 The classic spicy sauce is perfect on shredded chicken which can be used in rice bowls, salads, wraps, or however you want! Instant Pot Salsa Rice is the perfect meal or side dish to your favorite Mexican inspired dinner! Filled with fresh vegetables and only 4 minutes in the Instant Pot and this rice is ready to eat! Instant Pot Roasted Red Pepper Soup: Roasted Red Pepper Soup with Grilled Cheese Croutons is the perfect comfort food without any guilt! Make it in the Instant Pot, Slow Cooker, or on the stove top! 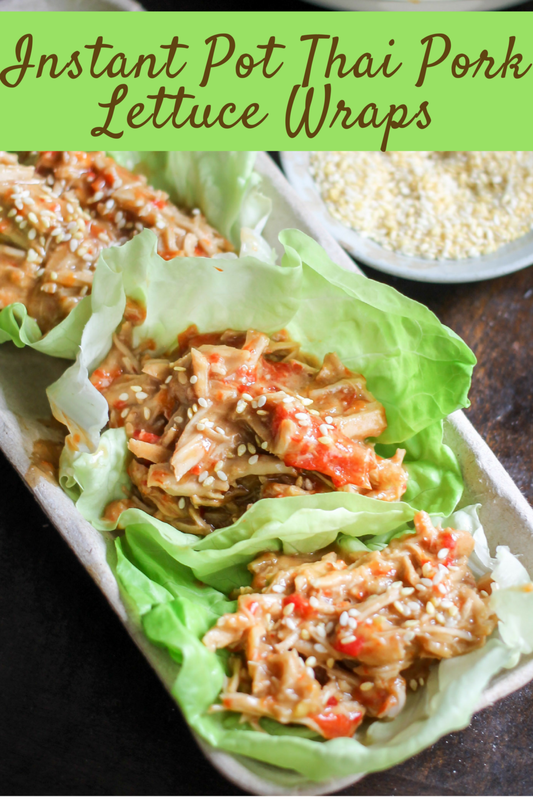 Instant Pot Honey Sesame Chicken Lettuce Wraps: Instant Pot Honey Sesame Chicken Lettuce Wraps are a delicious healthy meal that cooks in just 10 minutes! Simple to make, family friendly, and so tasty! Instant Pot Hard Boiled Egg Loaf: In five minutes you can have a whole bunch of hardboiled eggs which are perfect for egg salad! No peeling or ice bath for this Instant Pot Hard Boiled Egg Loaf! In a small bowl, add teriyaki sauce, rice vinegar, red pepper flakes, broth, and garlic; whisk to combine, set aside. In the instant pot, add oil, pork, red peppers, then pour the sauce over the top. Close the top of the instant pot, and make sure the valve is in the sealed position. Set to manual for 30 minutes**. Once the time is up, let the pressure naturally release for 10 minutes (so don't touch the switch). After 10 minutes, manually release the rest of the pressure. Open the top of the pot carefully. Remove the pork and shred. Turn instant pot to saute mode. Mix cornstarch and water in a small cup, then add to the sauce in the instant pot. Add peanut butter and stir until combined. Allow the mixture to come up to a simmer. Add shredded pork back to mixture, stir to combine. To serve, scoop into lettuce cups and sprinkle sesame seeds over the top. Enjoy! NOTE: If cooking with chicken - use 2lbs of chicken breasts. Set the Instant Pot to 10 minutes on manual. After the cook time is over, let the pressure naturally release for 10 minutes, then release the rest manually (flip the switch). Continue with above directions for the rest of recipe. I have got to make these! love a delicious light and healthy dish! This is the perfect light lunch. I could eat these for lunch everyday! Wow! Healthy means I can eat more, right? I would love to try these for dinner! They look so flavorful! These look so flavorful and tasty! Love that the IP does all the work! Nice! I’ve made many recipes in my instant pot and do all the cooking for my wife and I. I love to cook and love to try new things. With all that said, this recipe is terrible. Where’s the flavor? I was so excited to try this and the second I tasted it I was so disappointed. This is the first recipe out of all the ones I’ve tried with my instant pot that neither of us liked. Thank god I got my pork tenderloin on sale because it’s all going in the trash. Hi John- so sorry this didn’t turn out to your liking. I’ve made it for years and I even have a crock pot version on my site that people love! Not sure what happened on your end, but I hate to hear about food being wasted- apologies!